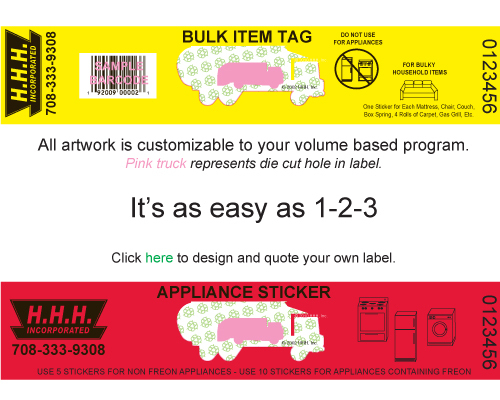 Bulk item tags, bulky waste stickers, and appliance stickers are specialty labels within pay as you throw programs. 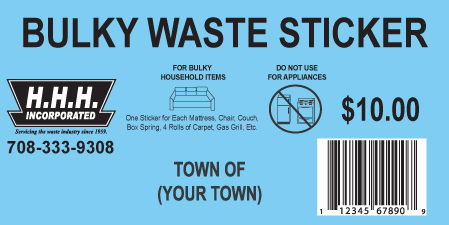 Our Bulk Item and Bulky Waste Tags are customizable to your program's needs. Whether you need them for appliances, CRT products, furniture, appliances or any other household items, we have the clip art and design capabilities to tailor them to your program. Due to the cost of these tags to residents, many customers have us insert regular barcodes onto the labels. If you are looking for a UPC barcode, we do not have UPC barcodes for sale. However, if you choose to go through the UPC process we can print that UPC barcode on your labels. Stop Label Counterfeiters Tip #4 - Use H.H.H. Incorporated's maximum security stickers in your program.